This sat on my counter probably a little too long. 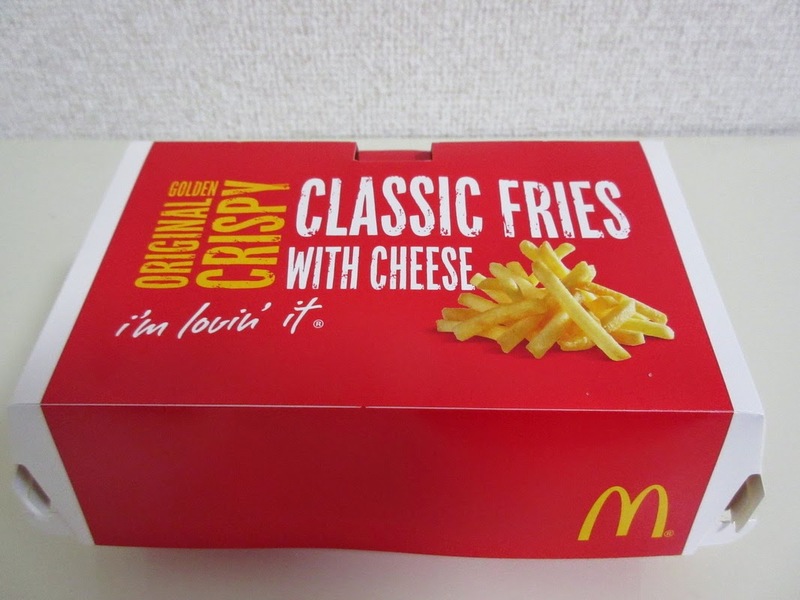 On 29 October 2014 McDonald's Japan released the "Classic Fries with Cheese", this promo ran for a little over a month, and ended around the first week of December. The fries themselves were nothing special, as they were the standard McDonald's Fries served in a box, but what was interesting to me was the Quattro Cheese Sauce you needed to squeeze all over your fries. I had my friend in Japan go pick one up for me, and send it down to Singapore for me to try. My friend did the same earlier in 2014 when he sent me the cheese sauce from the "American Vintage" Cheese Fries and Bacon. 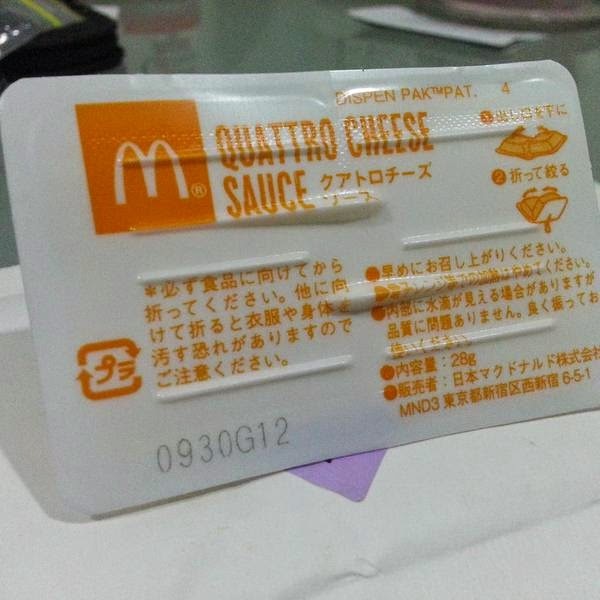 I had a couple packets of the Cheddar cheese original when they were re-released in Hong Kong later in the year, and you can see in the photo below that they added roughly 25% more cheese to this release. 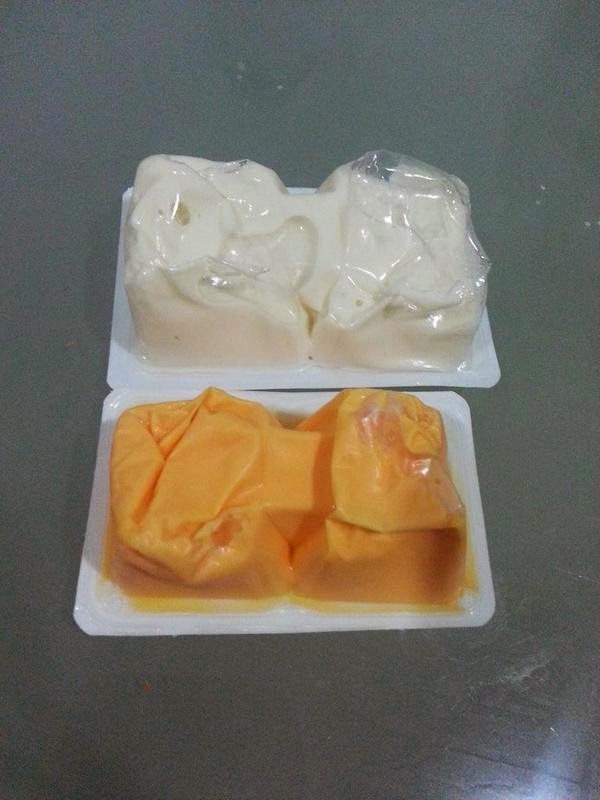 Although the packaging looked identical to the original, when I folded the package backwards in order to break the seal, immediately the cheese oozed out much faster than the original. The original cheese had a semi-firm stringy look and feel to it, but this was clearly more of a sauce-like consistency. I felt the original was difficult to keep on the fries, and the bacon topping would be near impossible to stay on since it was solid. Since this was liquid, it allowed a more even distribution across the fries, and it was easier to make sure you had a decent amount on each fry, although it didn't make for an appealing snack. Whereas the original was simply squeezable cheddar cheese, the "Quattro" in the name tells you that this version was made of up 4 separate cheeses, more specifically - Gorgonzola, Gouda, Cheddar and Mozzarella. Before I gave it a try, I half expected it to end up tasting like a white coloured version of the original cheddar sauce, but after my first bite it was easy to tell this was clearly a completely new sauce. The primary flavour was Gouda cheese for sure, and I'd probably say you somewhat taste Gorgonzola in there as well, but it honestly was pretty light on the others. I think they just called it "Quattro" as it's a trendy marketing word in Japan, and "Duo" probably didn't test as well. I was also surprised that this tasted less of processed cheese, and much more like fresh cheese than I was expecting. I know there's no way fresh cheese would have remained that consistency unrefrigerated for so long, but they definitely had the flavour down on this one. One other benefit of being saucy is that you could easily dip fries into it, which was impossible with the original. The only problem would had to have been the quantity. Although they had more cheese in the package than the original, since it was so runny, it didn't seem like there was nearly enough to coat more than the small fries I ordered to review it with. If I was in Japan and had a proper medium size, it probably would have felt a little underwhelming. I still have at least 8 packages of the original cheddar sauce (not sure what I'm going to do with them all), but this was the only one of the Quattro Cheese I had, and I'm a bit disappointed since I'd be happy to try it again.